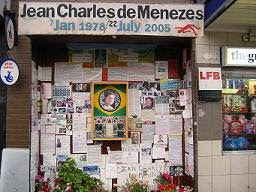 The inquiry into the tragic shooting of Jean Charles de Menezes has begun down the road at the Oval . This isn't the place to go over the details of what happened and why, and of course we hope that such things can be prevented in the future. I remember the day vividly, speaking to people who saw first hand what happened. There is a wider point about Stockwell though - we have inevitably become partly defined by the incident. Witness today's viral email with the highly inappropriate film poster on the platform. I believe Stockwell should not become an infamous place - linked simply to crime and awful incidents like the de Menezes shooting. In time, Jean Charle's family and friends will need to decide what should happen with the memorial that has been created outside the station. I'm not prejudging that in any way. Stockwell will be in the news for the next days and weeks, but it will be crucial that when the cameras go, we don't forget what happened that day, and that the legacy of that day can create something positive for our community.